Pterano sputtered, noticing that Cutter was under the water. He seemed to be attacking Fang. Fang was that impertinent sharptooth from before, wasn't he? Pterano couldn't clearly recall, but he tried to float on his belly now as best he could, so that Chomper could stay afloat, seeing as how he'd grabbed onto the flyer's tail. Pterano could only hope that the sharptooth didn't bite down to get a better grip! "Blasted current!" Pterano choked. "My wings aren't exactly meant for paddling, after all." he muttered, doing his best to "swim" with them, though not really doing much more than dfriting along with the current, which was starting to pick up in speed now. There was a dull roaring in his ears... something that was deeper than the rush of the river. "Mr. Threehorn!?" Pterano asked, surprised to see him here. "What are YOU doing here? Aren't you with the other group? And they're NOT my minions, for your information!" Was the threehorn switching sides? Had he decided to go with Pterano's group instead? Or was he just checking on Pterano because he didn't trust him? Norton had landed, but was immediately bowled over by the pink flyer who had seemingly started all this. "Ooof!" he cried, landing hard. "Watch where you're going!" Rinkus growled, trying to move behind Norton now. "Where I'M going? You're the one who... hey!" he cried, stepping aside to narrowly avoid a flyer dive bombing him. Norton slammed his fist into the backside of the flyer... rather hard. "Get lost! Crazy whackos! And what about you? You too much of a coward to fight?" he demanded of Rinkus angrily. Hyp meanwhile had pushed his way down to Cera. "Out of the way, sharptooth!" he said to Fang, brushing by him. "Hey! Hatchling!" he called to Cera. "Need some help?" He picked him up, and hefted her onto the shore. "There! Jeez! You're heavier than you look!" he said, smirking down at her. He then bared his teeth, wound up his arm, and socked a flyer square between the eyes. It crumpled into the river, not moving. Rinkus had taken off from Norton's combat zone, and had started following Pterano downriver. "Mr. Rinkus... if you wouldn't mind!" Pterano shouted, spitting out more water. "I could really use a hand!" "Um... not sure you have time for that!" the the pink flyer responded, gulping. "You're about to fall! Falling water up ahead!" he panted, pointing. "What!?" but Rinkus was right. There was indeed falling water... white foam and a sheer drop lay ahead of them. "Hang on, children! We're going for a bit of a ride!" he shouted as his body was suddely in freefall. He immediately spread his wings, and did his best not to roll over and dump his passengers off. Catching an updraft, the older flyer beat his wings, struggling to stay aloft with both Littlefoot AND Chomper on his back. "Was that really Cera's dad back there?" Littlefoot asked, clutching Pterano's neck for dear life. "Well..." Pterano said through a hoarse voice. "I do believe so. I hope he's not trying to spy on this group! Come on! Let's get back there and take stock!" Flapping his wings, and he turned around and began heading back in the direction he'd come, hoping to drive those flyers off and make sure everyone was safe. As Fang turned about, Ducky went falling back into the water. She managed to paddle her way up though. "Cera!" she spotted her friend near her, "kick" she instructed, trying to help, "Like I showed Tricia that time". She began kicking to show her. Cera tried to copy, but found little success. Ducky glanced about, trying to figure out where Fang now was, oh he was under the water. She dove down to see what they were doing. Atleast under the currents weren't to bad. Then she noticed something about the way the water flowed and her mind struggled to recall something her mother had said once on water conditions and such. Surfacing, Ducky noticed the problem. The river ended in a fall off. "G-Guys!" she dove down once more, focusing on the two sharpteeth as she noticed Hyp grab up and help Cera to shore, "We, we have to get out, the water, it drops of, it does!" she said, then struggled to paddle to shore against the hard current. On shore, Ridge did his best to help fend off the flyers dive bombing as well, "Anyone figure out yet what they want?' he threw out, even for sharpteeth this attack just hit the spiketail as random. Coughing, Cera had been unable to figure out exactly what had happened and who had grabbed her, but she now glanced back to see Hyp. He gave some smart comment about his saving her as well as weight. She frowned, "Hey, watch it!". Standing she mock pointed her horn in his direction, yet then sighed, "but thanks also...I guess". Thankfully she was distracted as she noticed the flyers Ridge and even Norton faced. They'd caused enough trouble, she figured. Gearing up she took a run at them and actually managed to hit one. Fang was about to take a bite at Cutter when he heard Ducky's warning, only then, with his focus not all on the smaller sharptooth did he really note that the current was picking up. His eyes widened slightly as he ran through the options in his head. He's dealt with strong currents before but there was never a waterfall at the end of those. He allowed himself to sink to the button, hanging on by digging his sharp foot-claws into the bed of the river. With Cutter on his tail he wouldn't be able to swim as well so this was the next best thing, he took slow and careful steps on the river bed, making sure to grip it and began to move towards shore. As he moved the sail on his back past close to Ducky, giving her something to hold on to if she wanted. It turned out, Mr. Threehorn was away from his group, half because they all wanted him to leave, and half because he was just so curious on how Pterano was doing. He got into a heated argument with Grandpa Longneck, got booed by most everyone else, and finally told them he was going to join Pterano's group to make sure everything was alright. Most of his group was glad to have him out their hair. the old threehorn galloped down the bank of the river, after all the kids in the water and, of course, Pterano. When he made it to the waterfall, he had to stop, and just look out at the flyer with a longneck and a sharptooth on his back. "Pterano! Would you mind explaining what's going on here!?" Meanwhile, Chomper crawled up a Pterano's back a ways for a better grip. His hace grimaced when he heard that old threehorn bellow out. "uh oh, he doesn't sound very happy! What's going on anyway? Why'd he follow us?" Cutter was loosing air, but he just kept his teeth sunk into Fang's tail, hoping he'd be able to get a gulp of fresh air soon. As Ducky fought to swim along as the current got even worse, she noticed Fang glide along by, with his sail near enough for her to grab onto. Since he seemed to be doing so well as moving through the water, she figured gaining a little help from that couldn't hurt. She reached over and grabbed the sail, smiling a bit as they seemed to be getting closer to shore. "Oh I hope the others are still ok too, I do" she said partly to herself. Pterano landed Chomper and Littlefoot safely beside Mr. Threehorn. "I haven't the foggiest! They just started attacking us! No good explanation whatsoever! I have no idea what these brigands are after!" 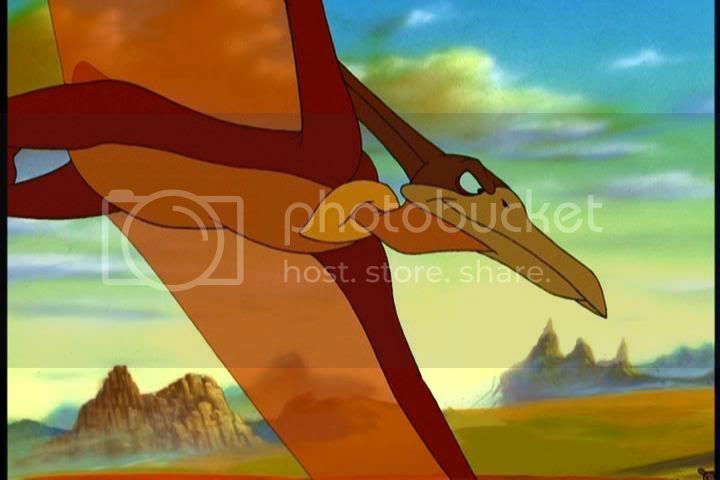 the flyer exclaimed as Littlefoot hopped off Petrie's uncle's back. So far... it seemed as if they weren't doing too poorly against their assailants. Rinkus landed as well, as he felt there was safety in numbers, and had warily noticed his enemies drawing closer the further away he got from the group. "So what do we do?" he asked, right as Hyp smashed his fist into the beak of one of the red flyers. "I..." Pterano thought hard for a moment. There had to be SOMETHING they could... accomplish. Hyp dove onto his belly, sliding along the river bank, and stretching out his arm for Fang to take hold of. "All right, sharptooth! Since you were kind enough to help my friend... here! Grab on!" he shouted, leaning out as far as he could to get a good grip. "Any ideas, Pterano? Anything at all?" Littlefoot asked as the flyer Cera bowled into went sailing through the sky, slamming into a rock wall a moment later. "Well... um... yes!" he said, an idea suddenly forming in his head. "Norton! Devon! Mr... Rinkus." He looked at the three other flyers. "The first two, start leading the children towards the Bright Circle! That way!" he pointed. "Stop when you reach shelter. Mr. Rinkus and I will head right to that female... the one who's behind this." "Yes... Mr. Threehorn... would you be so kind as to back us up?" he asked. "Gonna have to wait till we get... Ducky on shore!" Hyp grunted, straining for Fang. "Of course, of course. Anyway, start heading out! Go!" he said, hopping off the ground into the sky. "NOW Mr. Rinkus!" Rinkus glanced at the nearby Mr. Threehorn, and reluctantly hopped into the sky after Pterano. "Come on kids! Follow us!" Norton said, having slammed anothr flyer into the ground through his "hop and kick" technique. He'd jump up over a low flying attacker, then kick down on the his attacker's backside. Back with the other adults, Grandpa Longneck looked to the west, toward the Bright Circle that was on its long way down. "Hmm... Mr. Threehorn broke off a little while ago. I... I feel bad about what happened." the elderly longneck said. "Mrs. Flyer. Could you perhaps go and find him... just to make sure he made it OK? Also... check and see how your brother is doing." the longneck instructed. "You can return at sundown... or whenever is convenient for you." Mr. Threehorn was a little lifted up when Pterano asked for help. "Oh, sure I'll watch your back for you, you need it!" "But wait up, Mr. Pterano!" Chomper spoke up. "What about Cutter? I think he's still in the river!" Cutter couldn't hold his breath any longer, so he finally let go of Fang's tail, and let himself float up to the surface. After taking in a huge gulp of air, he looked around, and saw he was being swept right towards Hyp. His heart sank, but he knew he had no choice at this point. When he floated right up to the leafeater, he grabbed onto his face, since that was all he could reach. The fast biter climbed up on top of his head, and held on for his life. Pterano paused in mid flight, closing his eyes. The sharptooth... right. "Uh... yes! Of course!" Littlefoot raced over, holding his tail out for Cutter to grab onto as he clambered up Hyp's face. "Hey!" Hyp shouted, getting poked and prodded by the small claws as he shut his eyes to avoid any damage. "Get this sharptooth off me!" "Right! Here!" Littlefoot picked Cutter up with his tail. "Get onto my neck... or tell him to get onto my neck, Chomper!" Littlefoot added, remembering Cutter couldn't speak leafeater. As they reached closer to shore, Ducky hoped off as well, sliding down Hyp and to the ground as Fang grabbed onto him. She then turned to try and help with hauling Cutter in as well, although again, she wasn't sure what she could do, not being able to speak to him either. Mrs. Flyer nodded, "I was just wondering on them myself" she said, "I'll be back soon with...". "I'll come help you out, mom" Harper went to follow. "How did I know you were going to say that" her mother sighed, "alright but stay close. Yes I know" she went on as her daughter gave her that 'you're not talking to Petrie or anything' look. "I'll be back with word as soon as I can" she told Grandpa Longneck before flying off. It didn't take long for the sounds of a commotion to reach her ears. She sighed again, hoping that wasn't a bad sign and flapped towards it. What she found appeared to be all out pandemonium. "Stay back, Harper" she instructed her daughter before flapping down closer. Just in proving exactly how she could hold her own, she took out two of the flyers in her way on her way down closer to where Mr. Threehorn and Pterano were. "I was sent to check up, but...exactly what's going on and who are these flyers?" she threw for either of them who felt like answering. "Sis!?" Pterano exclaimed, being caught off guard by his sister's sudden arrival. "Well... we were set upon by these... ruffians!" he explained, trying to lay his words out in such a way that wouldn't cause her to suspect him of his usual shenanigans (though for once, he was innocent of those). "I'm going to confront their ringleader... that female who was above your nest the other night." he explained, when suddenly, a loud shriek sounded. The aforementioned female was bellowing out, and soon, the flyers mysteriously began breaking off their attack and wheeling up into the sky and away from the others. "Consider this a warning!" the female called down to them. "Progressing further will only lead to more woe!" Pterano raised a brow at this. "Woe? But there's green land over there!" he insisted. "I've been there plenty of times!" he landed, choosing not to pursue the retreating foes. "Is everyone all right?" he asked now, looking around. "Ah... Harper... there you are. I figured you wouldn't be far from your mother's side." he commented upon seeing her. Mr. Threehorn "Humpthed!" in anger up at the female flyer above him in the air. "I ain't gonna let another pompous flyer tell ME what to do! You wanna hurt our children, then you got another thing coming! Why dontcha come down here and fight me like a REAL dinosaur!" He was kinda going on and on. Following Littlefoot, Chomper gave the order. <Get up on Littlefoot's neck, Cutter!> The little fast biter jumped off the tennage dinosaur, climbed up Littlefoot's neck, and licked the longneck in the face to show his gratitiude. Chomper giggled from the sight. 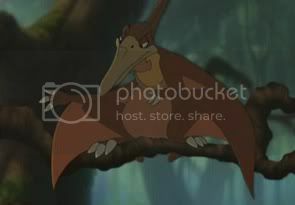 Petrie was on his mother's back, gazing down quietly from above. Mrs.Flyer just listened to all her brother said, not even jumping to find his actions suspicious. As he'd said, it was apparently a surprise attack that he didn't know of and had no way of knowing of. But more than that, she could usually tell when Pterano was hiding something or up to something, and he didn't give of that feel. Then, before she could even decide if she would advise Pterano not to take off after this head female, the flyers all ceased their attack. Petrie's mother quickly took stock that both her son, Harper, and the other children were uninjured it looked like as Ducky was now climbing safely back up to the shore. She half agreed with Mr. Threehorn's shout that this strange flyer had some nerve telling them something like that. Still, it put them in an odd spot. "Why would she not want us all there..." she half spoke her thinking thoughts allowed. She sighed, turning back to Pterano "Perhaps this land you found before is now claimed, though I agree, this is quite the way to tell someone that!" she glared at the spot of sky the flyers had disappeared in. Oh, it was a very bad blow if this was true, and the first real hope and option they had in finding a place was cut off as well. Harper shrugged at her uncle calling it out how predictable it was she was here; not that he wasn't right. "And just generally make sure everyone was ok" she said with a small smile. "Well, we are fine now, now that the mean flyers have left" Ducky commented to her, "though I do not know why they were attacking in the first place". She'd missed the announcement on the land. "Still think my dad's right, who does she even think she is!" Cera grumbled, narrowing her eyes. "Someone with friends who fight well" was one of the answers Ridge thought up and also said sort of to himself. Now on the shore, Fang shook himself dry and just looked at the entire group. His first encounter with them wasn't nearly as confusing as this. Why a bunch of Flyers would just begin to attack a herd of dinosaurs was beyond him. "Maybe someone touched their nest" he muttered to himself. Anthony,Martin,and Tyra played in the bushes near The Great Valley.The three young Sharpteeth,and their flyer friends Talon and Claw were always coming here to enjoy themselves.But today,they would finally speak to the other dinosaurs. Tyra walked over to the Three-Horn known as Cera. "Hello there" she said shyly,her razor-sharp teeth showing.